Supreme x Louis Vuitton Ugg boots, anyone? 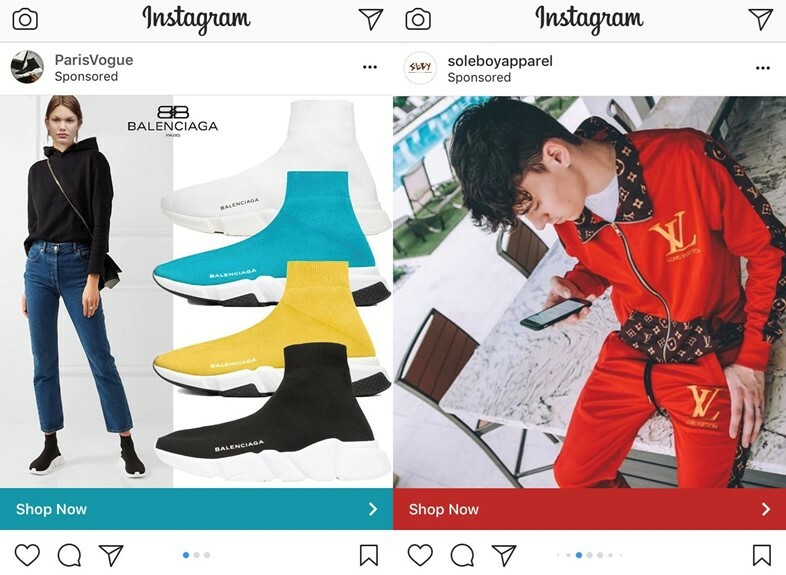 Whether it be Louis Vuitton logo-covered tracksuits that the Paris-based brand never made or authorised, Balenciaga sock trainers being offered at an unrealistic “70% off” from an account with the name ParisVogue, or the flood of Yeezy sneakers remarkably made available despite wild demand for them, Instagram is filled with fakes. Facebook, Inc., which owns both Facebook and Instagram, reported last month that it had removed nearly 3 million posts, including videos, ads and other forms of content, from its sites during the first half of 2017, in response to takedown complaints of counterfeiting and trademark and copyright infringement. Yet the counterfeit ads and rogue accounts, many posing as increasingly sophisticated sellers and resellers of luxury goods, keep coming. How exactly do these countless ads hawking fakes appear on your feed? They certainly run afoul of Instagram’s community guidelines, which state that ads must not contain content that infringes upon copyright and that the use of bots is unauthorised. And yet, these accounts pushing China-made counterfeits – many hosted by users which are more likely computer-operated accounts rather than actual people – continue to proliferate. Search #chanel, #prada or #gucci, and you’ll immediately find thousands of suspicious products being offered for sale. But while Instagram may be weeding out a significant number of infringing posts before they ever hit your timeline, no shortage of problematic posts advertising fake goods, both sponsored and not, are routinely slipping through the cracks. “Each week we review millions of reports and advertising images and there are times when we make mistakes,” a spokesman for Instagram says. The most interesting thing about it all is that users are actually buying these products. Thanks to the rise of streetwear and the Instagram effect – the need to have clothing that’s recognisable enough to show off to followers on social media – fashion has embraced a new era of branding, from Off-White’s stripes to the resurgence of the monogram and the dominance of the Supreme box logo. And counterfeiters have kept up – a look over on the subreddit r/fashionreps sees users laying out hundreds of knock-off items, from A$AP Rocky Guess tees to Raf Simons jeans, Supreme camping chairs and Comme des Garçons Converse. The appetite for replica goods is boosted by the the increased sophistication of counterfeit operations in 2018, which sees sellers turning out products that are nearly identical to the real thing for just a fraction of the cost (especially if an authentic product is made in China – chances are, according to a 2015 European Union report, the fake is being made in the same factory). But there is something else at play here – the high cost and limited edition nature of many products, including those that have been heavily advertised by brands and social media influencers. This ploy, which is meant to make products more desirable, is driving the average consumer – having been subject to such advertising efforts – to fakes in order to be able to get in on the action. Remember that $500+ logoed Gucci t-shirt that has saturated street style imagery and the Instagram accounts of your favourite stars, which, funnily enough, was put forth by Alessandro Michele as a play on the rampant counterfeiting of Gucci’s branding? There are now countless replicas of that tee – virtually indistinguishable from the real thing – available for a tiny fraction of that price lurking on social media. Ironic, right. Likewise, a quick search of Instagram for adidas’s various Yeezy sneakers, which are notoriously impossible to get when they hit the market due to their small-runs and often prohibitively expensive at resale – is a good example of how counterfeiters are thriving on consumers’ desire to get their hands on otherwise unavailable products. Louis Vuitton’s Supreme collaboration – which hit pop-up shops across the globe this past summer – is another example of this: it was limited in nature, expensive from the outset, and bore even more outlandish prices at resale. And yet, it was everywhere – on rappers on private jets and editors at fashion shows, yes, but also teenagers on the street. According to the 2015 report, fakes cost European brands the value of 9.7% of their total sales every year, or €26.3 billion – and then there’s the damage to a fashion house or label’s aura of exclusivity. Although you could certainly argue that Instagram is not doing enough to fight the availability of fakes on its platform, it is difficult to ignore the role that the fashion industry – and its desire to exist based on a model of eye-popping price tags and limited edition runs–might also be feeding this phenomenon of fakes, as well.